There is a great Chasam Sofer I noticed this week, parashas Vayeitzei. Forget about the angst regarding whether we really say the Avos kept the Torah, and just sit back and enjoy the fabulous construction. See the pesukim here. "ויפגע במקום, and he reached the place [J: where ויפגע is classically darshened as meaning tefillah and מקום is classically darshened as referring to Hashem; and Yaakov here was seen as having instituted Maariv] -- see Magen Avraham in Orach Chaim siman 267 seif katan 1 [J: about davening Maariv of Shabbat on Erev Shabbat, like Rav, because Maariv was instituted corresponding to the burning of the leftover limbs and fats]. This was Erev Shabbat Kodesh close to nightfall, and therefore he davened Maariv before the sun set [בא השמש, as the pasuk says] for the limbs and fats of Erev Shabbat may not be brought on Shabbat. And behold, Elifaz took his money, all that he had [J: as per a Midrash that he robbed him after pursuing him on Esav's command], based on the idea that one may give his purse to a non-Jew [J: on Erev Shabbat, so that one is not carrying it on Shabbat]. Therefore [J: because we see from these two acts that he was keeping the Shabbat], he saw in his dream וּפָרַצְתָּ יָמָּה וָקֵדְמָה וְצָפֹנָה וָנֶגְבָּה, and you shall spread west, east, north and south. For anyone who keeps Shabbat, he is granted an inheritance without limits. Therefore he set up a matzeiva and poured oil upon it, for שמן, oil, with its lettered spelled out in full, is שין מם נון, which is the gematria of שומר [J: the ש and מ and ו are in both, and then, to get the ר, which is 200, see that there are 3 נ worth 50 each, a מ worth 40, and a י worth 10]. And מצבה spelled out in full is מם צדיק בית הא, which is gematria שבת [J: namely, the ב and ת are in both, and then, to get to the ש of שבת, which is 300, you have ק, which is 100, two מ and two י for the next 100, then צ for 90 + the ד and א and ה for 10, for a sum of 300]. And so, you have שומר שבת. 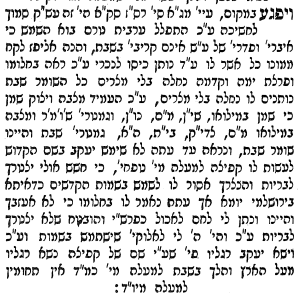 And it appears that until now, Yaakov did not make use of the Holy Name to perform the act of traveling [J: quickly, קפיצה, as per the midrash that here was kefitzat haderech] higher than 10 tefachim , for he worried that perhaps he would have to depend on others, and one who depends [on others] is forbidden to make use of the holy names, as is stated in Yerushalmi Yoma. and he was promised that he would not have to depend on other people. Therefore [J: as in the conclusion of his vow], וְהָיָה ה לִי לֵאלֹהִים, that he would make use of the Names. And therefore [Bereishit 29:1] וַיִּשָּׂא יַעֲקֹב רַגְלָיו, to explain, that based on the Name used for kefitza he lifted up his feet from upon the ground, and traveled on Shabbat higher that 10 tefachim, in accordance with the opinion that there is no techum Shabbat higher than 10 tefachim." End quote of Chasam Sofer. This is as described for Eliyahu Hanavi in Eruvin 43a, see my discussion. Note how the term קפיצה is used there in Eruvin. Does קפיצה mean swift travel or hovering travel? It is interesting how these interplay here. Also interesting to me was the neatness of the two gematriot. They were both regular, in that both used the full spellings of the letters of the words; and in finding that two items possessed identical gematria, one could first find the matching letters, and then, having eliminated those, the remaining letters formed a multiple of 100. I think this is an artefact of it being produced by a human using his natural, though remarkably astute, faculties. This is the sort of gematria one might come up with, using skills of pattern recognition. Whereas other gematriot with arbitrary matches on every single letter to add up to arbitrary sums might be much harder, without the aid of books or programs which point out correspondences. Maybe. I haven't made a study of it, but I wonder if there might indeed be some signature to the type of calculations involved in various human-produced gematriot.